Welcome to the Millis Elementary School Building Project website. This site is devoted to informing the community about the Elementary School Building Project (ESBP) and the actions and deliberations of the Millis Elementary School Building Committee (ESBC). On the site you will find information about upcoming events, announcements and documentation regarding the project. For questions on the project please email schoolproject@millis.net or click on the email button in the left margin. Construction progress is well underway at the new Clyde Brown Elementary School project. There was a little down time in early January due to the very, very low temperatures for over a week straight, but the project is moving earthwork again. Please visit the Projects Facebook page for the most up to date information. The Town of Millis and the Millis Public Schools hosted a very successful Ground Breaking Ceremony on December 8, 2017. In attendance were Town Officials, School Administration, Elementary School Building Committee, School Committee, Massachusetts School Building Authority, State Senators representatives, State Representatives, High School band, and the entire Clyde Brown Elementary School student body and teachers. Please see the Projects Facebook page and local TV for coverage of the event. The Clyde Brown Elementary School project has successfully completed all the local and state permitting requirements to allow the start of the project. The Millis Voters reaffirmed their approval of the project at the November 6, 2017 Fall Town Meeting. The Board of Selectmen and the Elementary School Building Committee have approved the early (partial) Construction Contract to start the site work phase the project with your Construction Manager Agostini Bacon Construction. Erection of the construction Fence will start on November 16th. The site contractor will mobilize and begin site work the week of November 20th. Congratulations to all in involved who helped make this long awaited milestone possible! The design team will continue to develop the final plans for the project. The completed construction contract will all subcontractor bids is anticipated to be approved in late February 2018. The letters can also be emailed through the MEPA assigned reviewer Anne Canaday at Anne.canaday@state.ma.us until September 12th when the public comment period closes. The design team completed the Design Development (DD) phase of the project and has submitted the progress design plans to the MSBA for their review. The current rendered site plan from the Permitting submission can be viewed here. The ESBC and the BOS hired Agostini Bacon Construction as the Construction Management firm for the new school. Agostini was also the Construction Manager on teh Police and Fire Station projects in Town and did great job on those projects. The project is on schedule and the design team has made all the initial permitting submissions. The Project is scheduled for permitting review meetings in September and October with the local review boards and with a state agency. The project is on track for a construction ground breaking in November 2017. The ESBC has updated the Frequently Asked Questions in the FAQs tab of this website and on the project's Facebook page. The design team is in the Design Development (DD) phase of the project working on the details of the building. The ESBC and the BOS are in the process of hiring a Construction Management firm that will eventually build the new school and site work once the design is complete. Thank you to all the residents that came out to vote their support for the project at the May Town Election and the June Annual Town Meeting. The ESBC and the project team are moving forward with the building design. The design team has begun the Design Development (DD) phase of the project working on the details of the building. The next step for the ESBC is to hire a Construction Management firm that will eventually build the new school and site work once the design is complete. Please check the Project Facebook page for the most up to date milestones for the project. There is a facebook link on the left margin of this webpage. The Massachusetts Inspector General’s Office approved Millis’s application to use the ‘Construction Manager at Risk’ project approach. This type of approach requires a commitment by a Construction Manager (CM) to deliver the project within a Guaranteed Maximum Price.~ The CM will be an integral team member during the design/development stage while the construction documents are being developed, and will enable feedback on cost, schedule and constructability of the proposed project during the design phase. Unlike the traditional design-bid-built process, the CM at risk process improves the communication between the owner, designer, and contractors while assisting in reducing cost overruns via change orders incurred during other approaches. The Massachusetts School Building Authority (MSBA) granted an additional 1% reimbursement for this preferred method of construction. The MSBA at its May 12, 2017 Board of Director’s meeting approved an Estimated Total Facilities Grant of $20,951,710.~ In the event that the MSBA determines that any owner's and/or construction contingency expenditures are eligible for reimbursement, the Maximum Total Facilities Grant for the Proposed Project may increase to as much as $21,423,711. The final grant amount will be determined by the MSBA based on a review and audit of all project costs incurred by the Town in accordance with the MSBA's regulations, policies, guidelines, and the Project Funding Agreement. The Elementary School Building Committee have provided an informational flyer to help explain the needs and the benefits of the proposed project. Please click on this link to familiarize yourselves with the project ahead of the May 1st Town Election and June 5th Annual Town Meeting. For a complete list of the public presentation meetings for this project please review the left margin of this webpage or the project's Facebook page. To view some of the recent public presentations or download the slide show then please click on the "Presentations" tab above. To view answers to some recently asked questions then please click on the "FAQ" tab above. The Elementary School Building Committee held a community forum on Saturday March 18th in the Community Room at the Millis Police station at 10:00 AM. An overview of the work done to date, up-to-date plans, as well as the project budget and schedule were presented. The Elementary School Building Committee held a community forum on Thursday March 2nd in Town Hall room 229 at 7:00 PM. An overview of the work done to date, up-to-date plans, as well as the project budget and schedule were presented. Thank you to all who came out to familiarize themselves with the project ahead of the May election and Town Meeting. To watch the video of this presentation then please click on this Video link. After a lengthy review of options for renovating and adding on to the existing Clyde Brown School as well as new school options and after community input on both the location and scope of the project, the Millis Elementary School Building Committee (ESBC) submitted its decision to the Massachusetts School Building Authority (MSBA) for approval. In September 2016, the MSBA approved the Town of Millis’ preferred option to replace the existing CFB. For the past several months the ESBC and the School Department, with the assistance of the architect and project manager, developed the schematic design which is roughly 25% of the whole design process. 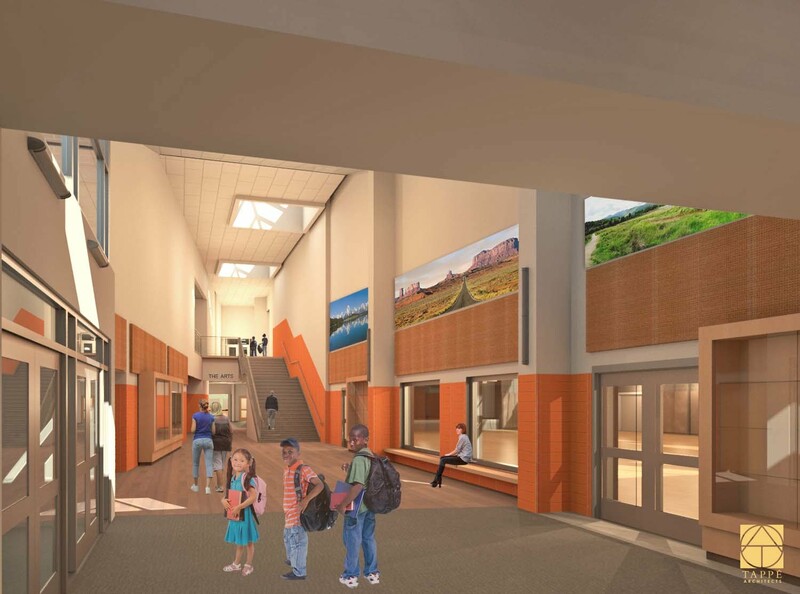 In March, the ESBC will submit this proposed design, along with the, budget, requested maximum reimbursement and schedule for the proposed project to the MSBA. The MSBA Board of Directors will vote at their May 10, 2017 meeting to formally approve the project’s scope and a funding agreement. At its February 15, 2017 meeting the ESBC reviewed the estimated project budget that had been developed by the architect’s project estimator and reviewed by the Town’s project estimator (retained through Compass Project Management, our project manager consultant). The budget includes estimated construction costs and “soft costs” (design costs, administration costs, furniture and equipment and project contingencies.) This budget will be submitted to the MSBA for approval at their May 10, 2017 meeting. Reimbursement from the MSBA is based on their determination of eligible costs. Although the MSBA approved a base reimbursement rate of 52.89% for this project, and the project may qualify for certain incentive reimbursement points, the MSBA does not reimburse certain costs on all MSBA projects. The estimated reimbursement from the MSBA may range from $21 - $21.6 million. A final number will be provided prior to Town Meeting Funding Vote. Estimated net cost to the town: is a range of $30.3 – $31 million. Since the MSBA reimburses on a monthly basis as the project moves along, the Town will only need to borrow its share. We should note to taxpayers and voters that although the Town will only need to borrow the Town share, the MSBA requires that we appropriate the full amount of the project cost. Therefore, while the tax impact is based on the Town share, the warrant article will require an appropriation of the total project cost currently estimated at $51.8 million. Funding for this project will require Millis to vote for a debt exclusion which will be amortized over 30 years. Property taxes for this project will increase for this time period. Once repaid, the temporary tax increase will be revoked. The estimated annual cost for a Millis resident will be provided at the May Town Meeting, although exact figures will not be known until the time of bond issuance, the annual cost to an average family home valued at $357,000 will be in the range of $550 to $650 annually. The ESBC plans to hold at least three community forums prior to the May election and May Town Meeting in order to inform our fellow citizens of the details of the project. Residents are encouraged to attend and learn more about the project and to ask questions. In addition to the community-wide forums, members of the ESBC will be presenting all available information to various boards and committees and intends to address board specific questions. Citizens are encouraged to attend these informational meetings as well. To secure funding from the MSBA voters must approve the full project appropriation of funds for the project via a debt exclusion ballot by a simple majority at the Spring Town Election to be held on Monday, May 1, 2017, and then at the Spring Town Meeting on May 8, 2017 where a two-thirds majority vote will be required. The ESBC’s responsibility is to work with Millis residents to achieve the best solution for both students and taxpayers for the aging Clyde Brown School. The ESBC is committed to an inclusive process that seeks to ensure that the school district’s educational objectives are met and that much needed building system and infrastructure inadequacies are addressed in the most fiscally responsible manner. The ESBC finalized the land swap parcels with the Massachusetts Executive Office of Energy and Environmental Affairs (EEA). A copy of the plan that was presented at fall Town Meeting 2016 can be viewed here. The Project team presented the final Land Transfer plan at the School Committee Meeting on November 1st prior to the fall Special Town Meeting. The project achieved approval of the Preferred Option submission from the Mass School Building Authority in September 2016. Please click on the design tab for renderings of the approved conceptual site plan and floor plans. For those residents unable to attend the second Community Forum held on 4/13/16, the presentation can be found on Presentation tab of this website. As a reminder in order for the ESBC to submit the Preferred Schematic Report in June the school district must have control of all land where the current building and any of the new building options are sited. Presently the Town controls land where a portion of the existing Clyde F. Brown School sits and all the land where the two new school options would be built. The mechanism for the control of the sites from the Town to the Schools is a two-thirds vote of Article 44 at Town Meeting on May 9, 2016. School Committee meeting on Tuesday, 5/3/16 at 7:30 PM in the Middle School/High School library. Pre-Town Meeting at the FinCom meeting on Wednesday, 5/4/16 at 7:30 in Town Hall, room 229. In Millis, we focus on personalizing instruction and are severely constrained by our facilities. Our Clyde Brown Elementary School, while well maintained, now poses challenges in supporting our educational plan and vision for the students of Millis. In order to build upon our success as a District it is critical that we provide an environment for our students that supports the educational plan. The feasibility study phase affords us the opportunity to determine the best strategy for upgrading our facility to insure our educational objectives are met as well as address much needed building systems and infrastructure issues. In concert with the MSBA, we have developed a Timeline for the project that will result in final selection of a preferred option in May 2016. The MESBC is determined to conduct a fully transparent and process-driven analysis to determine the preferred option. To assure that we have optimum public input in that decision, we will be hosting three community forums between now and then. We strongly encourage townspeople to monitor social media and this site for information about those forums. For additional information regarding the specific needs driving the project please view our Project Needs Summary in the Feasibility Study Tab. Meet our Architect with a short 3 minute video.